The highest quality TV Covers provide superior protection from dust, moisture, & static for your Outdoor (or Indoor) Flat Screen Television. See our great feedback and customer photos! Best quality designer craftsmanship with attention to the finest details (all top-stitched seams with color matched thread and velcro) and superior quality materials for great appearance and durability to protect your flat screen TV, LCD TV, or plasma television with our Custom Outdoor TV Covers. * Custom made TV Cover for your TV with a perfect fit for YOUR television and mount. * Wide variety of individual options for a truly custom TV cover to fit your personality. * Custom covers for cable boxes, DVD or Blu-Ray players, and satellite equipment. * Great pricing--only pay for the options you desire in a Custom TV Cover. * Ultra-Fast FREE delivery on cable box covers. * Back Mount Opening completely reinforced (see pic) with vinyl facing for durability. * Email monitored 24/7; get fast response to all questions. * Attention to Detail--Thread and Velcro are color matched to each vinyl color offered. All seams are professionally top-stitched for a beautiful finished look. * Dealer, installer and multi-order discounts available. Please call or . If you don't see what you like, let us know what you are looking for. * Custom Silhouettes are now available at the same price as any of our other stock silhouette designs. Just select "Custom Photo " from the Design Silhouette drop down menu on the "Buy Now" page and be sure to email your image to us following your order. For best results, the subject in your custom photograph should have a distinct shape and reasonable contrast. You may email your photograph to us prior to your order to determine suitability. 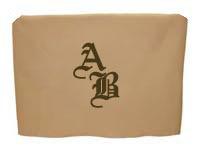 Get Monogram embroidery for only $35.00--up to 3 letters in your choice of true type fonts (total embroidery size up to 11" x 17") with puchase of any Custom TV Cover. Place order as usual on our easy one page order form. Select "Yes" on the Monogram drop-down and enter your choices of Font, Style, Letters, and Letter Color. Lining is recommended when choosing embroidery. It provides a soft smooth interior against the TV screen by covering the interior side of the embroidery and also supports the emboidery for additional durability. We will contact you as soon as we receive the order and email a preview image of your choices for your approval prior to manufacturing your cover. You may always contact us at 858-537-7898 if you have any questions. The first row shows suggested two character layout options and the second row shows our three character layout options, each one demonstrating a different Font, Style, and Letter Color. 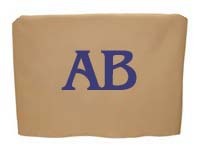 You may also order a single character monogram (not shown in these images) from the dropdown on the order form. Custom TV Covers welcomes corporate accounts. We are experienced in manufacturing custom covers for teleconferencing systems and other corporate equipment. We create individual custom covers for every customer whether the order is for one outdoor TV cover for an individual household, or multiple TV covers for corporate accounts, hotels, restaurants, and sports complexes. We offer discounts on our Custom Television Covers to dealers, installers, corporate accounts, and individuals ordering more than three covers per year. Contact us for more information. Please check back frequently for updates to our web site and available product line. If you have questions or would like more information please to email us. 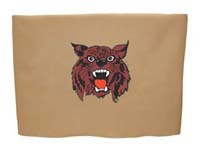 **Covers with custom embroidery or silhouette designs may take two or three days to ship. *^ "Refer a friend" applies to our customers who have previously purchased a Custom TV Cover and then refers a friend whose purchase is over $100. The new customer placing the new order must mention name of person referring him or her at the time of the order.